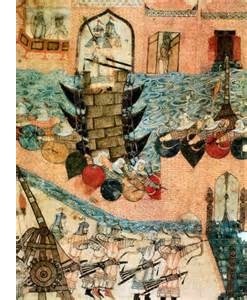 Fall of Baghdad (1258) - The Fall of Baghdad is rarely studied in the West. But in the Islamic world, it is akin to what the Fall of Constantinople is to the world of Christendom. Not only was it the cultural center of Islam in the Middle Ages, but its destruction marked the end of the last Arab Caliphate (it would soon be replaced by the Turkic Ottoman Empire). After Genghis Khan conquered the Kwarezmian Empire (see Genghis Khan), he returned to his native land. He was rumored to have made plans to attack the Abbasid Caliphate, which was in serious decline after years of conflict with Crusader and Turkic armies, but he died before he could execute those plans. The Abassid caliph, Al-Musta'sim, saw the ferocity with which the Mongols conquered and agreed to become a vassal of the Mongol Empire and pay tribute. But Genghis' grandson, Möngke Khan, had an appetite for new conquests. He raised the Abbasid tribute to an unpalatable amount with the expectation that Al-Musta'sim would refuse to pay it. The caliph, for his part, apparently did not respect Mönke as he had his predecessor. Not only did he refuse, but he taunted the Mongol ruler as well. He would not live long to regret his decision. Möngke dispatched his younger brother, Hulagu Khan, along with a mighty army of about 150,000 troops (likely the largest Mongol army ever assembled for one battle) to punish Al-Musta'sim for his insolence. Upon his approach, Hulagu offered Al-Musta'sim one last chance to meet Möngke's demands. The caliph's grand vizier, Ibn al-Alkami, assured him that regardless of how large the Mongol army was, it could not conquer the city. He refused the demand, trusting in the city's walls to protect its people. As the Mongol army approached, Al-Musta'sim sent out 20,000 cavalry to try and stop it. A foolish move. Hulagu's massive force quickly overwhelmed the Abbasid cavalry. His engineers diverted the Tigris River and trapped the caliph's men on a man-made island. Then he slaughtered them. On January 29, 1258, the siege of Baghdad began. The Mongols erected a barrier around the city and dug a ditch between it and the city's walls to prevent the possibility of escape or counter-attack from the city. They brought siege engines with which to assault Baghdad's defenses. Within a week, Hulagu weakened the city's defenses to where it became clear that it was only a matter of time before they would crumble. Al-Musta'sim's attitude quickly changed and he tried to negotiate with Hulagu. But it was too late. Hulagu was now bent on Baghdad's destruction. On February 10th, the city surrendered. The Mongols waited three days until the 13th before entering the city for reasons unknown (perhaps to increase the citizens' sense of foreboding). When they did enter, they began a campaign of wholesale destruction. Al-Musta'sim was captured and forced to watch the murder of his people, whether they were men, women or children. The exact numbers are not known, but at least 80,000 were killed and some say as many as a million. The city was virtually razed to the ground. Mosques, palaces, schools, and perhaps most significantly, the famed House of Wisdom were all destroyed. Finally, Caliph Musta'sim was killed as well. Most accounts say the Mongols rolled him up in a rug and had him trampled by horses. In less than a month, Baghdad went from being the cultural center of Islam to being practically a ghost town. It took several centuries for the city to recover. Today, of course, Baghdad is once again one of the largest cities in the Middle East.